Additive modelling and the HadCRUT3v global mean temperature series What is ordisurf() doing...? Updated The URL to the HadCRUT3v data set changed following the release of version 4 of the data set (12 January 2015). Updated This post was updated on 17 July 2011 following comments from readers. Yesterday (June 11, 2011) the BBC reported on comments by Prof. Phil Jones, of the Climatic Research Unit (CRU), University of East Anglia (UEA), that the warming experienced by the planet since 1995 was statistically significant. That the trend in the recent data was now significant when last year it was not, was attributed to the fact that one more data point (year) was now available for the analysis and Jones highlighted the utility of long-term monitoring data as more data is collected in detecting pattern in noisy data. 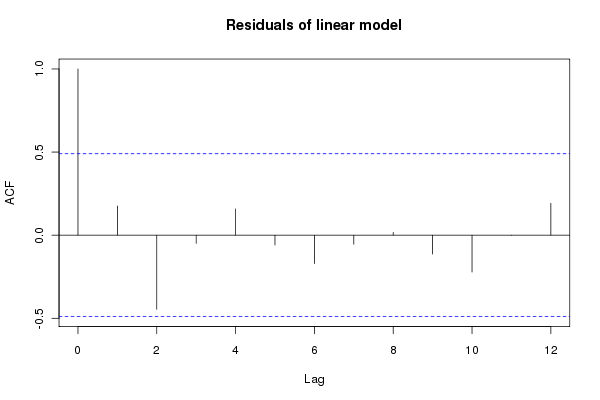 In this post I wanted to take a closer look at these data and illustrate how we can use R to fit regression models to time series data. The data need a little post processing to clean them up as the provided format also has, in every other row, the number of stations used to form each temperature data point. We won't consider those data in this post, but as they provide information as to the likely uncertainty in each observation, we could use those data as case weights in the analysis. The data come as monthly means, with an annual mean column at the end. The data are anomalies from the 1961-1990 mean. ## Don't need the even rows --- perhaps do as case weights? but given the small sample size there is not much to be worried about here, though note the observations with large residuals and their leverage, which could indicate an undue influence on the model parameters. 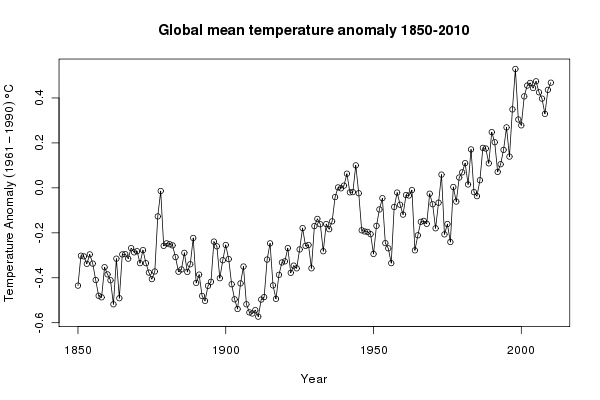 What does this tell us about underlying mean temperature of the recent few years? 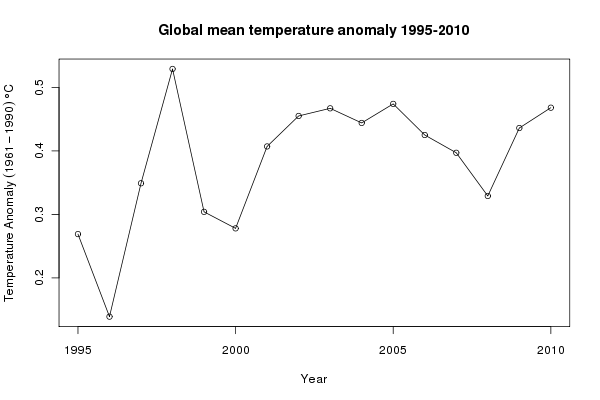 The linear trend doesn't fit the data all that well; in fact, one could argue for a flat trend the latter half of the 1995–2010 period, and when viewed in the context of the data leading up to 1995, the fitted trend appears to substantially underestimate the increase in global mean temperature. A non-linear trend migth do a better job. By focussing on only the very recent observational period, we have neglected to consider the constantly evolving mean temperature over the past 160 years. It has always seemed to me somewhat perverse that climatologists and climate sceptics alike ignored the decades of data before the recent period and then argued the toss about the sign and strength of a linear trend in the recent period, often claiming that there is insufficient data to ascribe a statistically significant pattern in defence of their particular point of view. To me, it seems far more sensible to fit a model to the entire series of data, but to use a regression technique that can model local features of the series rather than the global trend over the entire data. That model could then be used to ask questions about whether temperatures have increased in a statistically significant manner for whatever period one liked. 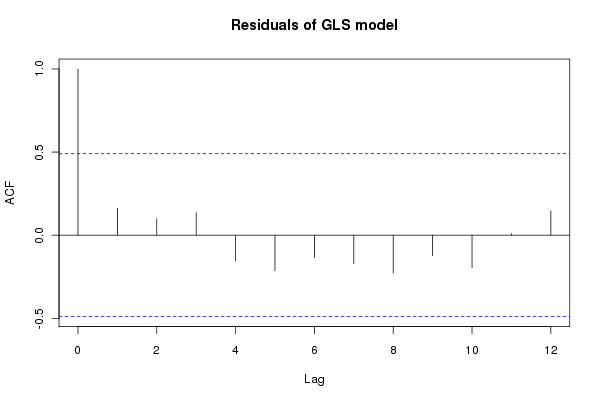 In a follow-up posting, I'll demonstrate one such modelling technique that builds upon the concepts introduced here of using regression models with auto-correlation structures for the residuals. This exercise just reinforces the futility of trying to identify significant trends, or lack thereof, with such a small sample of data. Using the full data set, an additive modelling approach and the use of derivatives suggests that temperatures were significantly increasing well after 2000. See this post for details.